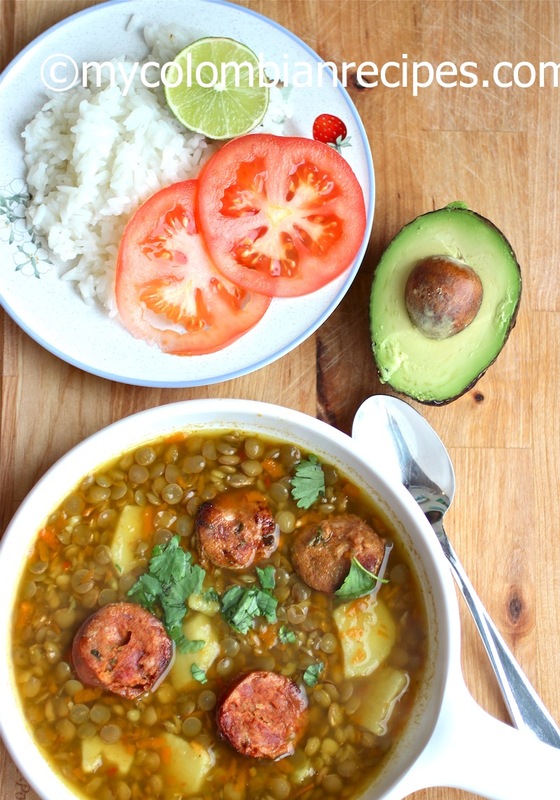 Sopa de Lentejas or Colombian Style Lentil Soup is a standard in a lot of Colombian kitchens, the Colombian chorizo sausage gives the soup extra flavor. This is a very substantial soup that would make a meal-in-a-bowl served with white rice. In a small bowl, mixed the heavy cream with chopped cilantro and lime juice and season with salt and pepper. Cook the chorizo in the oil in a large pot over medium heat, stirring occasionally, about 5 minutes. Using a slotted spoon, transfer the chorizo to a plate lined with paper towel. Add the carrots, onion, garlic, tomato and scallions to the pot, season with salt and pepper. Cook stirring occasionally about 12 minutes. Stir in the cumin and cook 1 more minute. Add the lentils and water, bring to a boil. Then reduce the heat to medium low, cover and cook until the lentils become tender but not mushy about 45 minutes. Add chorizo and potatoes, cook for 15 to 20 minutes until the potatoes are fully cooked and fork tender, thin with water if necessary. Ladle into soup bowls and top with cream if using and serve immediately. I love chorizo sausage and would really love this soup – it sounds excellent! 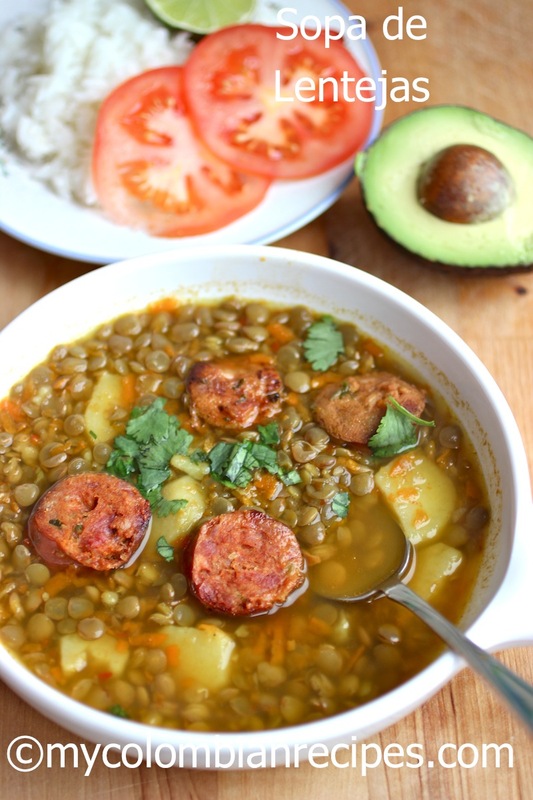 Love chorizo and have been looking for a new lentil soup to try! Sounds good. Thank you! This soup was PERFECT! My husband really enjoyed it. Delicious! I made this for my Colombian wife while she was at work on a cold winter day. When she arrived home and tasted this soup, she was in heaven. Thank you Kimberly. I made this soup for my family and we loved it. I followed all the steps and it was perfect. This soup is filling my house with a lovely scent! I make a soup to share with the working parents who come to my knitting group every Monday, so I am always on the lookout for a new twist on an old favorite. 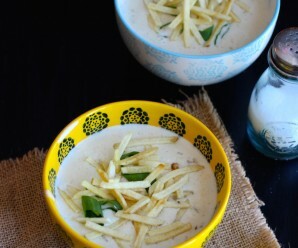 This is delicious with or without the cilantro cream. Thank you for putting Colombian recipes within reach and helping us make them taste authentic. You take me back to my college roommate’s mother’s house in Bogota. Arepas for breakfast, soups for lunch, onces and other treats fill my memories. Now I can make them for my family and take them with me down memory lane. Muchas Gracias! Thanks so much Erica for this recipe. 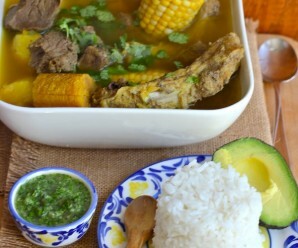 My daughter-in-law is Colombian and she makes this for us all the time and we love the dish. I’ll be able to surprise her with it for a change. She also uses a ham hock and cooks it with soaked lentils for an hour and a half before adding the other ingredients. Hi, Is this the typical “lentejas Colombianas” or just lentil soup? 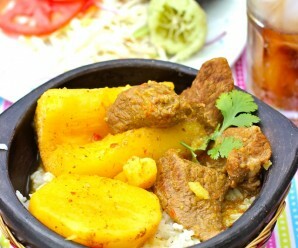 Looking to make the typical “Colombian lentejas”. Thx! Absolutely delicious! Thank you so much for sharing! I served mine with sliced avocado. The recipe is one of the best I’ve had! Do you have to soak the lentils ahead? If so for how long and any tips? You don’t have to soak the lentils. Wash and rinse very good! Thx! So excited to make then for the first time. My abuelita use to make this all the time 🙂 this meal will bring back some amazing memories. I made this last night and it was THE best. My son (who is 7) is very picky and devoured this dish. Thank you!!! I made this for my Colombian husband, he took a bite, and told me it was just like what his mother makes. Perfect! I love your recipes. I’m half Colombian myself and this recipie I very similar to my moms. I want to know if adding sweet potato rather than white potato and if would change the taste? This was another winning recipe, Erika. I doubled the amount of cumin based on personal preference, otherwise it was perfect! 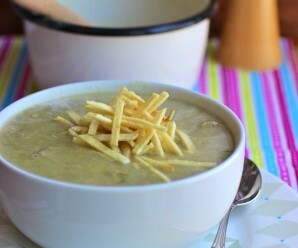 This soup was delish, my husband loved it also and he loves his hometown recipe but this one has been bump to the top of our list! Thank you for a wonderful recipe! Could I use chicken broth instead of water? Would this be good? I have made this recipe with both Colombian chorizo and grilled Italian sausage. If at all possible go out of your way to locate Colombian sausage as the recipe is so much better with it. If you can’t find Colombian chorizo, a good second choice would be dried Spanish sausage. (In Atlanta we have a choice of several brands of Colombian sausage, and morcilla, in the freezer section of the Buford Highway Farmer’s Market). I donr have easy access to Colombian sausage, I do it with pork, turkey and beef polska kielbasa. Enjoy! Everything I’ve made from the recepies on here has tasted like back home. 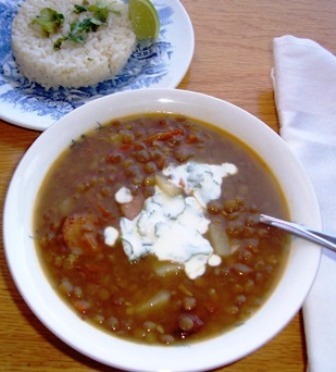 I loved this lentil soup, super tasty and filling. If I leave out the chorizo, should I add any extra flavoring to my soup? Perhaps some Maggi?